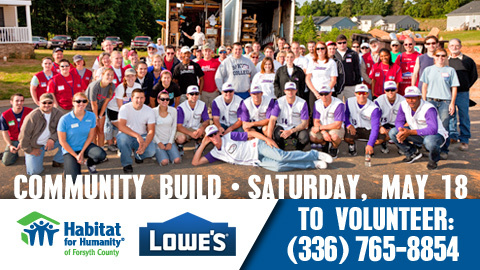 WINSTON-SALEM, N.C. (MAY 7, 2013) – The Winston-Salem Dash will partner with Lowe’s Home Improvement and Habitat for Humanity of Forsyth County to assist in the annual Community Build on Saturday, May 18, from 7:45 a.m. to 2 p.m. The build project is truly a community effort, so Dash fans are encouraged to help, too. To register as a volunteer, call Habitat for Humanity of Forsyth County at (336) 765-8854. Everyone’s efforts will be honored during the Dash’s game on Saturday, July 27, at 7 p.m. A special video will be shown at BB&T Ballpark in dedication to this year’s Community Build. The first location at 1825 Willow Oak Way features three houses, one of which is very near completion. The other two homes are at 922 and 924 Roosevelt Street. One of these houses, donated to Habitat for Humanity of Forsyth County, is undergoing a complete reconstruction, while another home will be built on the property. This donated lot was big enough to divide in half to accommodate a second house. The Dash are continuing their drive toward one million fans at BB&T Ballpark, and this milestone will be reached sometime in May. For tickets, call the Dash at (336) 714-2287 or visit wsdash.com. This article originally appeared on the official website of the Winston-Salem Dash. Click here to view the original story. The Winston-Salem Dash honored Rich Brenner as this year’s Service Through Sports Award winner and announced that Habitat for Humanity of Forsyth County is the Dash’s official charity for the 2013 season at the annual Coaches Luncheon Tuesday at BB&T Ballpark. Brenner, an award-winning sportscaster for FOX8, began his broadcasting career in 1967 as a correspondent in Vietnam. Originally from Merchantville, N.J., Brenner’s full-time television career started in 1975. He arrived at FOX8 in 1987, and his time in Winston-Salem yielded six awards, including three Southeast Regional Emmy Awards. He retired in 2008 following a 21-year career at FOX8. During his retirement, Brenner, who served as a United States Marine, continued to be a major presence in the community, making public appearances to honor community members, including those who served in the military. Before he passed away last year at the age of 65, Brenner was working on a veterans’ memorial at Triad Park in Kernersville. 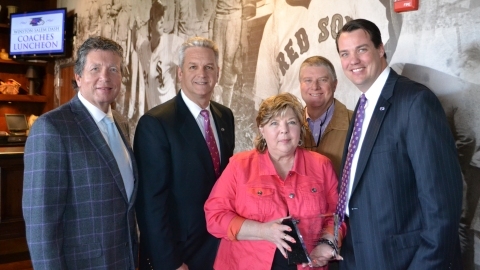 Brenner’s family accepted the Service Through Sports Award on his behalf. Brenner is the fourth winner of the Service Through Sports Award. The late Clarence “Big House” Gaines, who coached Winston-Salem State University’s men’s basketball team for 47 years, was the inaugural winner in 2010. Wake Forest University baseball coach Tom Walter took home the honor in 2011, while Bob and Lisa Gfeller’s work through the Matthew Gfeller Foundation was recognized last year. The Dash also announced that Habitat for Humanity of Forsyth County will be the team’s official charity partner for the 2013 season. Habitat for Humanity of Forsyth County brings together community partners and volunteers to help qualified Partner Families construct and purchase well-built, affordable homes and become successful homeowners. Through the organization’s global efforts, Habitat for Humanity has built homes in 90 countries and all 50 states. They have also built homes for more than 350 Partner Families in the Winston-Salem community. As the Dash’s official charity for the season, Habitat for Humanity of Forsyth County will partner with the Dash for their Commemorative Brick Program. Entering its fourth year, the Dash’s Commemorative Brick Program allows members of the community to purchase a brick that will be installed outside BB&T Ballpark’s main gates. The Dash and Habitat for Humanity of Forsyth County will collectively use the program’s proceeds to further their community outreach efforts. The Coaches Luncheon also served as the community’s first chance to meet the Opening Day roster for the Dash. New manager Ryan Newman spoke to those in attendance, while every member of the 2013 Dash was introduced. Many local media members were on hand for the event, which also served as the Dash’s annual Media Day. Newman and select players were available for interviews before the squad’s first official workout of 2013 at BB&T Ballpark.